The final straw was when one of her daughters keyed her new minivan. camera (WFMY News 2) A North Carolina mom pictured here is on strike to protest her children's 'out of control' behavior. A North Carolina mom is leading a one-woman march up and down the sidewalk outside her house. Carrying a sign that reads "Mom on Strike," Naasira Muhammad is protesting against her two teenage daughters' "out of control" behavior, WFMY reported. The single mom said she was set off when one of the girls keyed her brand new minivan, according to WFMY. 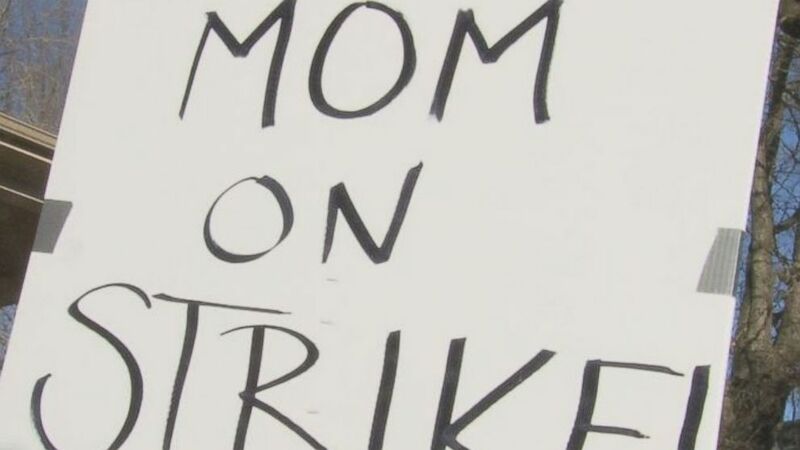 (WFMY News 2) "This is the sign a North Carolina mom on strike carried up and down the sidewalk by her house." The Winston-Salem mother said she even called the cops after her van was scratched up, but the police told her they couldn't do anything without eyewitnesses. It's unclear whether the family has patched things up yet. ABC News reached out to Muhammad today, but she declined to comment. When ABC News visited her house today no one was apparently home. 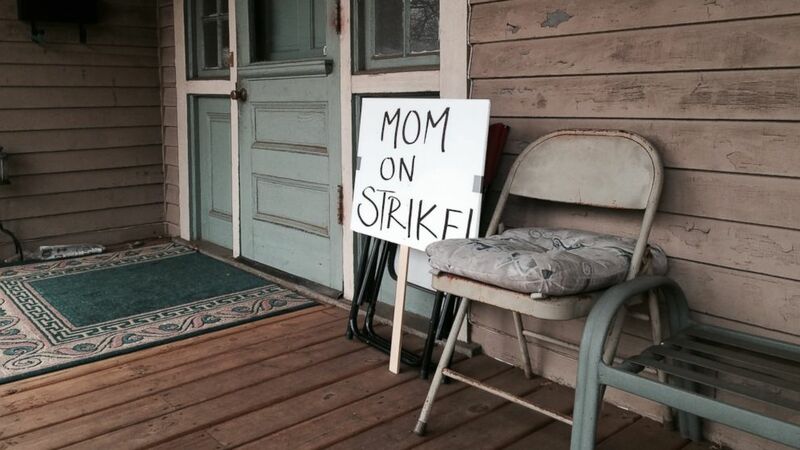 However, her "Mom On Strike" sign and chair were sitting visible on her porch. 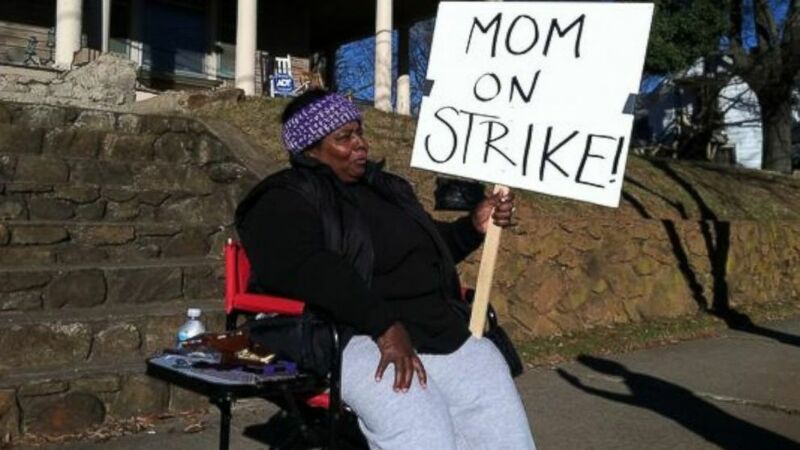 (Jason M. Volack) The "Mom on Strike" sign was found on the North Carolina mom's porch on Friday morning, Jan. 23 when the mom was apparently not home. Muhammad has been reportedly picketing since last Friday. She told WFMY that punishments like time-outs and lectures don't work with her teens. "I threw my hands up in the air," Muhammad said. "I prayed about it. I'm through. I'm a mom on strike, and I don't care how long it takes." Her girls also took to the street after being forced by an aunt to make gratitude signs, according to WFMY. One sign read "Thank you mom for providing for me, caring for me, and loving me." 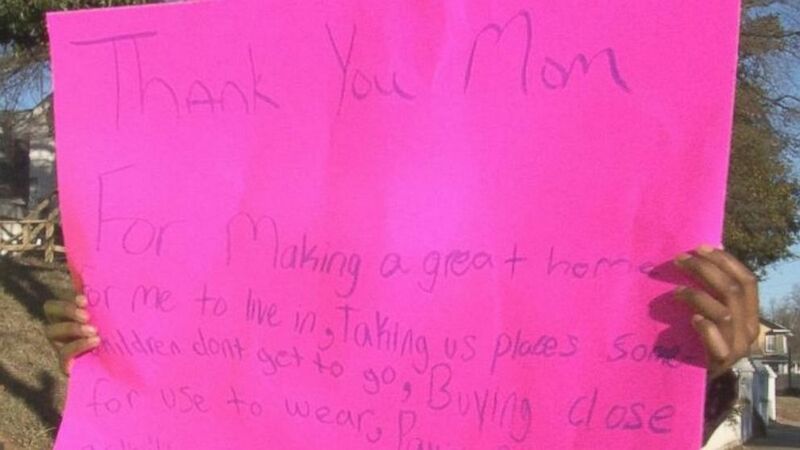 (WFMY News 2) The children's aunt forced them to make these signs to apologize to their frustrated mom. They haven't tried to genuinely apologize on their own, though, according to People magazine. (WFMY News 2) A North Carolina mom is frustrated with her two daughters pictured here, one of whom scratched her minivan with a key. Meanwhile, people on social media are abuzz. @peoplemag - Good for her! They need to grow up and appreciate her. Others are blaming Muhammad for her children's unruly behavior. @peoplemag Bad parents create bad children most of the time. She should blame herself. However, the blame game is unhelpful and shames the family from getting the help it needs, psychologist Jill Weber told ABC News. Weber, a member of the American Psychological Association, did not treat Muhammad but runs a private practice in Washington, D.C.
"People want [blame] to be clear cut, but unfortunately, it isn't," Weber said. "What we really want in situations like this is for families to feel like they can access help. And blaming on social media makes people feel shame, and that stops people from getting the help they need to get unstuck." Weber did say, though, that going on strike is an impulsive move that shows your children you don't have control over them. "As a single mother, it's difficult to draw limits," she said. "It can be pretty daunting. It's important to get a support system." This support system can be in the form of therapists, church groups, community mental health centers, support groups and schools. Taking care of yourself and getting support from others can then empower you to start setting simple, but firm limits to get your teens in control, Weber said. "The important thing is that you start with two to three absolute rules, and then stick by them and the consequences of not following them," she added. "I've definitely seen similar situations, and I know with little changes in a family's day-to-day interactions, things can absolutely get better." Despite the mixed reactions, Muhammad seems to stand by her public protest.